At this time of the year my garden is full of edible flowers. The dainty flowers of lavender, thyme, marjoram and mint sway in the summer breeze and their scent can be amazingly soothing and beautiful. When I see and smell them I want to gather to use in my cooking. Flowering herbs attract pollinating insects, including bees. As the striped visitors forage for pollen and nectar, flowers vibrate with their frenzied activity. ‘There must be something good in these flowers’ I think as I watch them go about their business. Indeed there is. I think of new ideas for using them in cooking. Lavender is a wonderful herb to use in both sweet and savoury dishes. It can be scattered over puddings and cakes and strewn over grilled meat such as pork and lamb. Rather as you would other woody herb like rosemary or thyme. Today I have teemed lavender up with some chia seeds soaked in milk and blueberries. As I sprinkled the tiny pale mauve flowers over the juicy blueberries the fragrance was gorgeous. I decided not to add any sweetener to the mix. I really enjoyed tasting something that was fruity but not too sweet. One thing to note is the price of chia seeds varies enormously from £13 for 500g in Tesco to £7.50 for the same amount in Waitrose. So do shop around for a good price. It can be worth your while to do so. A small portion of chia seeds porridge made with 25g of seeds is low i fermentable carbohydrates and other components that trigger symptoms. But as with any food try a small portion before you increase the amount you eat. I love chia because it is gentle and soothing to eat. The consistency is rather slippery and wonderful. It is another variant of ‘frogs spawn’ type milky puddings which amused us so much as children. This is an adult version of a nursery room favourite. Place the chia seeds in a bowl and add the lactose free milk. Whisk the seeds and milk together and leave to soak for at least an hour or preferably two. Place the blueberries in a tall jug and process with a stick blender (or liquidise). This forms a dark blue purée. Place a a heavy bottomed pan on the hob to heat up. Sprinkle the seeds over the base of the pan and toast them until they begin to brown. Remove the seeds from the heat and allow to cool a little. Check the lavender over for insects and remove any you see. Rinse the flower heads and mop dry with a little kitchen paper before picking off the delicate flower heads to scatter over the seeds. 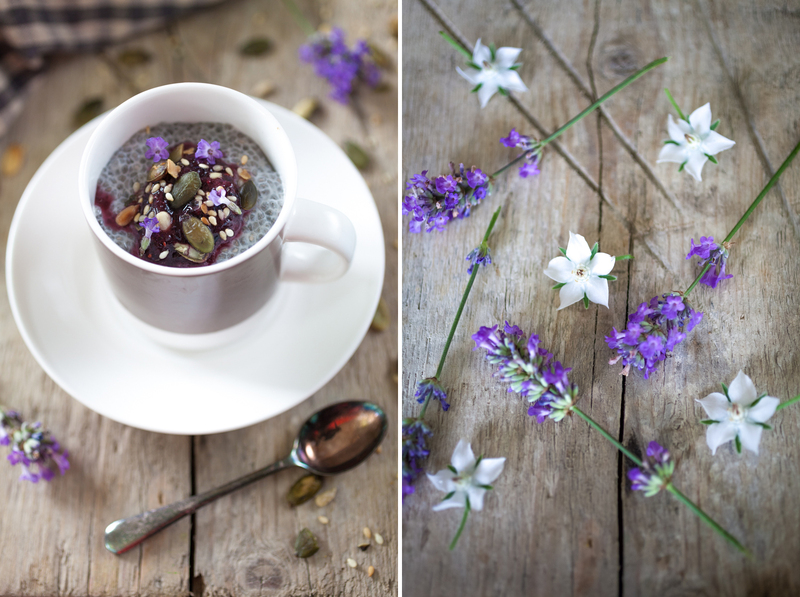 Place a few teaspoons of blueberry purée in the base of a cup or glass, spoon over a layer of hydrated chia seeds and finish with the toasted seeds and lavender flowers. NB White borage (shown below) is also in flower now in the UK. I use it to decorate drinks, salads and puddings. The chopped leaves are a bit hairy but taste of freshly cut cucumber. 01 Aug	This entry was written by Joan Ransley and published on August 1, 2015 at 11:25 am. It’s filed under Breakfast, Food on the go, Lunch, Pudding, Snack and tagged almond milk, bleuberries, canned, chia, Chia seeds. Bookmark the permalink. Follow any comments here with the RSS feed for this post.